This guide covers basic information to register a Red Hat Enterprise Linux system quickly and to attach and manage subscriptions effectively. 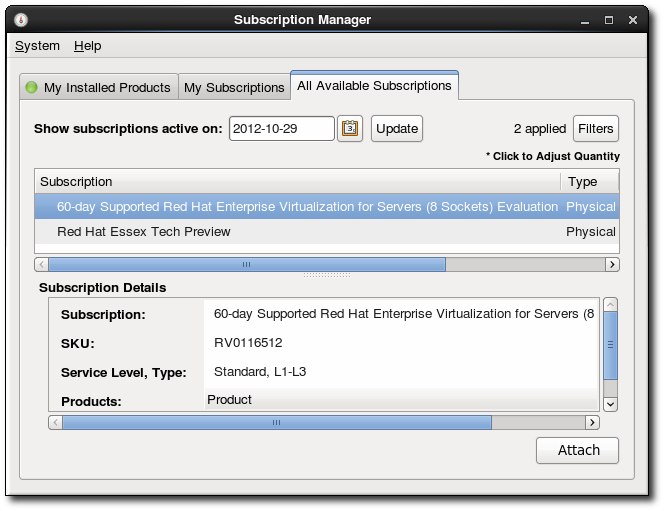 Advanced Subscription Manager configuration is covered in Using and Configuring Red Hat Subscription Manager. Effective asset management requires a mechanism to handle the software inventory — both the type of products and the number of systems that the software is installed on. Red Hat Subscription Manager is installed on a local system and it tracks what products are installed, what subscriptions are available for the system, and what subscriptions are actually used by the system. It also tracks subscription expirations and automatically attaches new subscriptions based on the products and hardware. Red Hat Subscription Manager works with content management tools (yum) to help install and update content on the local system. Most systems require simple registration. 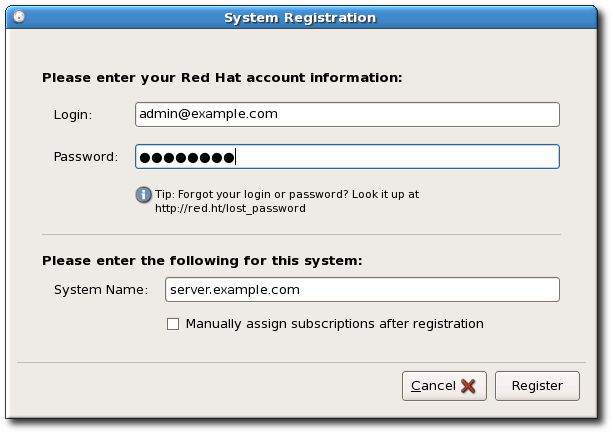 The default configuration registers the system with the main account for the company, hosted on the Red Hat Customer Portal. It is also possible to register a system with Subscription Asset Manager or with another subscription service, with some modification to the Subscription Manager configuration. 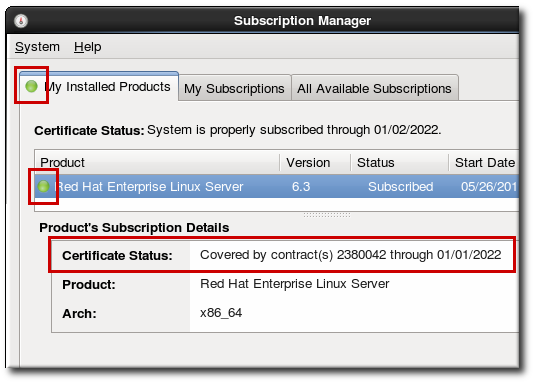 More advanced Subscription Manager configuration and usage is covered in Using and Configuring Red Hat Subscription Manager in the subscription management documentation set. 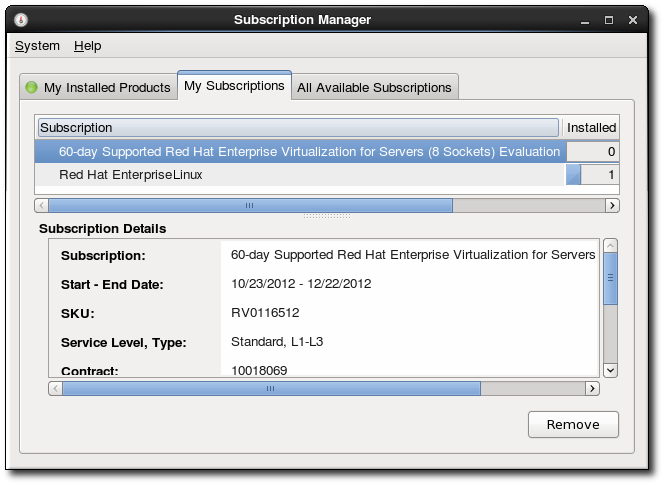 Both registration and subscriptions are managed on the local system through UI and CLI tools called Red Hat Subscription Manager. 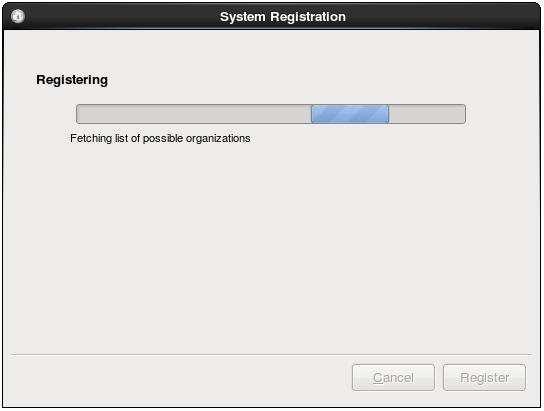 The Red Hat Subscription Manager tools are always run as root because of the nature of the changes to the system. 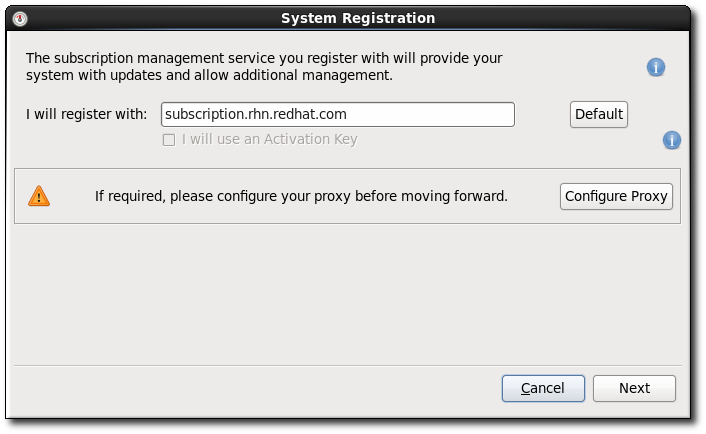 However, Red Hat Subscription Manager connects to the subscription service as a user account for the subscription service. 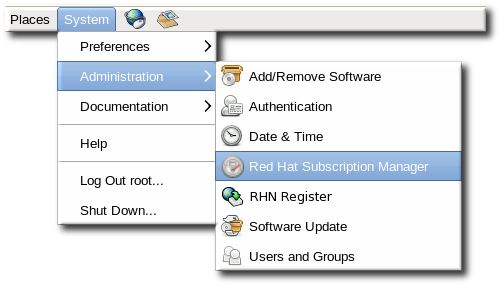 Red Hat Subscription Manager is listed as one of the administrative tools in the System > Administration menu in the top management bar. Each command has its own set of options that are used with it. The subscription-manager help and manpage have more information. register Registers or identifies a new system to the subscription service. unregister Unregisters a machine, which strips its subscriptions and removes the machine from the subscription service. attach Attaches a specific subscription to the machine. redeem Auto-attaches a machine to a pre-specified subscription that was purchased from a vendor, based on its hardware and BIOS information. remove Removes a specific subscription or all subscriptions from the machine. list Lists all of the subscriptions that are compatible with a machine, either subscriptions that are actually attached to the machine or unused subscriptions that are available to the machine. 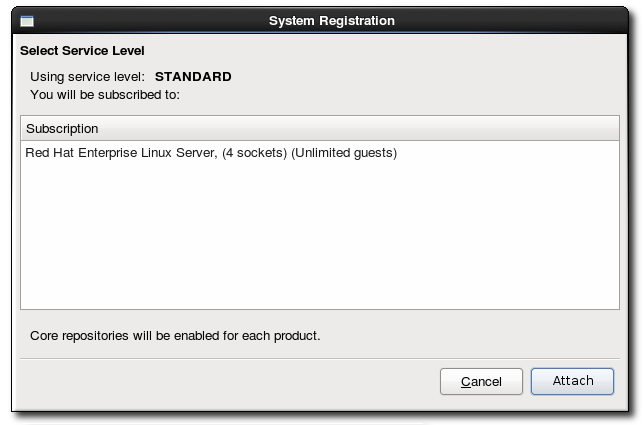 Systems can be registered with a subscription service during the firstboot process or as part of the kickstart setup (both described in the Installation Guide). Systems can also be registered after they have been configured or removed from the subscription service inventory (unregistered) if they will no longer be managed within that subscription service. If the system is not already registered, then there will be a Register button at the top of the window in the top right corner of the My Installed Products tab. However, for Subscription Asset Manager or Satellite 6, the user account to use is created within the on-premise service and probably is not the same as the Customer Portal user account. Optionally, select the Manually assign subscriptions after registration checkbox. By default, the registration process automatically attaches the best-matched subscription to the system. 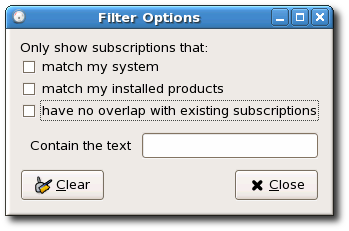 This can be turned off so that the subscriptions can be selected manually, as in Section 3, “Attaching and Removing Subscriptions”. When registration begins, Subscription Manager scans for organizations and environments (sub-domains within the organization) to which to register the system. With the default setting, subscriptions are automatically selected and attached to the system. Review and confirm the subscriptions to attach to the system. If prompted, select the service level to use for the discovered subscriptions. Subscription Manager lists the selected subscription. This subscription selection must be confirmed by clicking the Subscribe button for the wizard to complete. The simplest way to register a machine is to pass the register command with the user account information required to authenticate to Customer Portal Subscription Management. When the system is successfully authenticated, it echoes back the newly-assigned system inventory ID and the user account name which registered it. The register options are listed in Table 2, “register Options”. 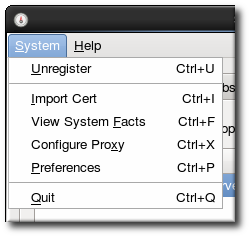 The register command has an option, --auto-attach, which allows the system to be registered to the subscription service and immediately attaches the subscription which best matches the system's architecture, in a single step. This is the same behavior as when registering with the default settings in the Subscription Manager UI. Assigning a subscription to a system gives the system the ability to install and update any Red Hat product in that subscription. A subscription is a list of all of the products, in all variations, that were purchased at one time, and it defines both the products and the number of times that subscription can be used. When one of those licenses is associated with a system, that subscription is attached to the system. Open the All Available Subscriptions tab. Optionally, set the date range and click the Filters button to set the filters to use to search for available subscriptions. match my system shows only subscriptions which match the system architecture. match my installed products shows subscriptions which work with currently installed products on the system. have no overlap with existing subscriptions excludes subscriptions with duplicate products. If a subscription is already attached to the system for a specific product or if multiple subscriptions supply the same product, then the subscription service filters those subscriptions and shows only the best fit. contain the text searches for strings, such as the product name, within the subscription or pool. After setting the date and filters, click the Update button to apply them. Select one of the available subscriptions. Open the My Subscriptions tab. Select the subscription to remove. Click the Remove button in the bottom right of the window. Attaching subscriptions to a system requires specifying the individual product or subscription to attach, using the --pool option. The options for the attach command are listed in Table 3, “attach Options”. Alternatively,the best-fitting subscriptions, as identified by the subscription service, can be attached to the system by using the --auto option (which is analogous to the --auto-attach option with the register command). A system can be attached to multiple subscriptions and products. Similarly, a single subscription or all subscriptions can be removed from the system. Running the remove command with the --all option removes every product subscription and subscription pool that is currently attached to the system. It is also possible to remove a single product subscription. Each product has an identifying X.509 certificate installed with it. The product subscription to remove is identified in the remove command by referencing the ID number of that X.509 certificate. Run the subscription-manager tool with the --serial option to specify the certificate. Systems can be set up with pre-existing subscriptions already available to that system. For some systems which were purchased through third-party vendors, a subscription to Red Hat products is included with the purchase of the machine. Red Hat Subscription Manager pulls information about the system hardware and the BIOS into the system facts to recognize the hardware vendor. If the vendor and BIOS information matches a certain configuration, then the subscription can be redeemed, which will allow subscriptions to be automatically attached to the system. If the machine does not have any subscriptions to be redeemed, then the Redeem menu item is not there. 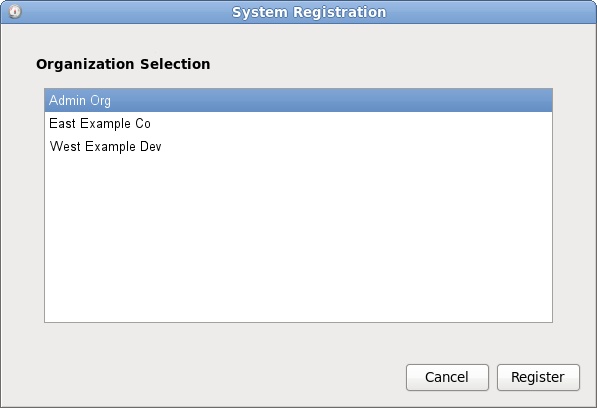 If necessary, register the system, as described in Section 2.1, “Registering from the UI”. 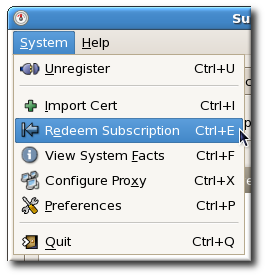 Open the System menu in the top left of the window, and click the Redeem item. 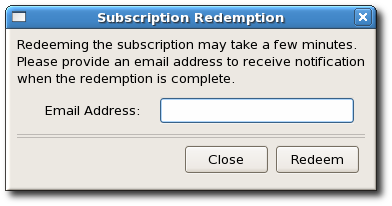 In the dialog window, enter the email address to send the notification to when the redemption is complete. 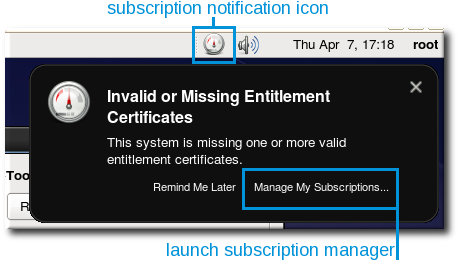 Because the redemption process can take several minutes to contact the vendor and receive information about the pre-configured subscriptions, the notification message is sent through email rather than through the Subscription Manager dialog window. It can take up to ten minutes for the confirmation email to arrive. A local Subscription Asset Manager can pre-configure subscriptions to use for a system, and that pre-configured set of subscriptions is identified by an activation key. That key can then be used to attach those subscriptions on a local system. If there are multiple organizations, it is still necessary to specify the organization for the system. That information is not defined in the activation key. This is especially useful when autoattach is scheduled as a job, which runs daily to ensure that all installed products and current subscriptions remain active. Both a service level preference and an operating system release version preference are set in the System Preferences dialog box in Subscription Manager. Select the System Preferences menu item. Select the desired service level agreement preference from the drop-down menu. Only service levels available to the Red Hat account, based on all of its active subscriptions, are listed. Select the operating system release preference in the Release version drop-down menu. 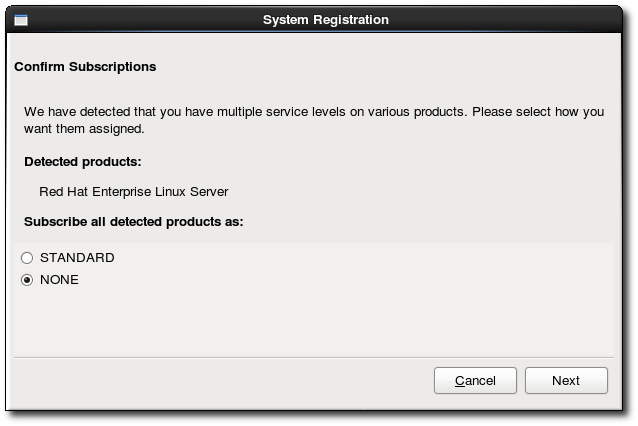 The only versions listed are Red Hat Enterprise Linux versions for which the account has an active subscription. The preferences are saved and applied to future subscription operations when they are set. To close the dialog, click Close. A general service level preference can be set using the service-level --set command. First, list the available service levels for the system, using the --list option with the service-level command. Then, set the desired level for the system. A service level preference can be defined when a subscription operation is being run (such as registering a system or attaching subscriptions after registration). This can be used to override a system preference. Both the register and attach commands have the --servicelevel option to set a preference for that action. The --servicelevel option requires the --auto-attach option (for register) or --auto option (for attach). It cannot be used when attaching a specified pool or when importing a subscription. Many IT environments have to be certified to meet a certain level of security or other criteria. In that case, major upgrades must be carefully planned and controlled — so administrators cannot simply run yum update and move from version to version. Setting a release version preference limits the system access to content repositories associated with that operating system version instead of automatically using the newest or latest version repositories. For example, if the preferred operating system version is 6.3, then 6.3 content repositories will be preferred for all installed products and attached subscriptions for the system, even as other repositories become available. A preference for a release version can be set when the system is registered by using --release option with the register. This applies the release preference to any subscriptions selected and auto-attached to the system at registration time. Setting a preference requires the --auto-attach option, because it is one of the criteria used to select subscriptions to auto-attach. 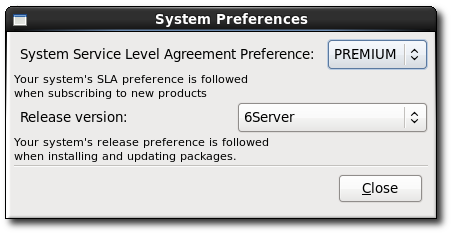 Unlike setting a service level preference, a release preference can only be used during registration or set as a preference. It cannot be specified with the attach command. The release command can display the available operating system releases, based on the available, purchased (not only attached) subscriptions for the organization.